Last week I was talking about having a dinner in Jumeriah Beach Hotel while I was walking in the lobby. I should have being talking about something more valuable if I'd known it would be formed a week later. 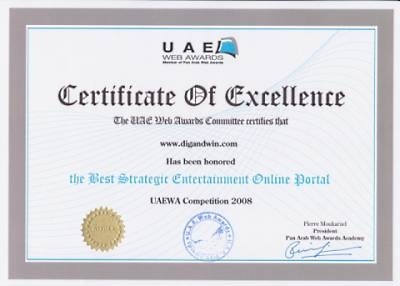 Dig and Win won two awards in UAE Web Awards ceremony held there. That was a damn boring event, and I still hardly get what all the buzz were for. It was a web design companies show to their customers. I believe that the current live version of Dig and Win does not worth a prize, I really don't like the graphics, but I was sure from the date of submission that we will win in one or two categories, and we won two. 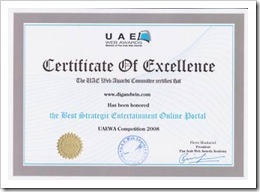 Actually at the end of the day UAE is a developing country and the most successful web businesses here are similar to small web businesses in rural USA. We introduced something very new that just the act of talking about it is prize-worthy. I can't stop making fun of Microsoft representative there, who waist his speech by talking about IE8. I myself could have market Microsoft design and development tools to the mostly professional web designers much better than him.